See a wedding package you like? An intimate wedding at one of my favorite beaches. I provide email and phone consultation to help you design the perfect wedding ceremony. We typically won’t get a chance to meet before the wedding so I like to be available as much as possible during the process so you are completely at ease on your wedding day. 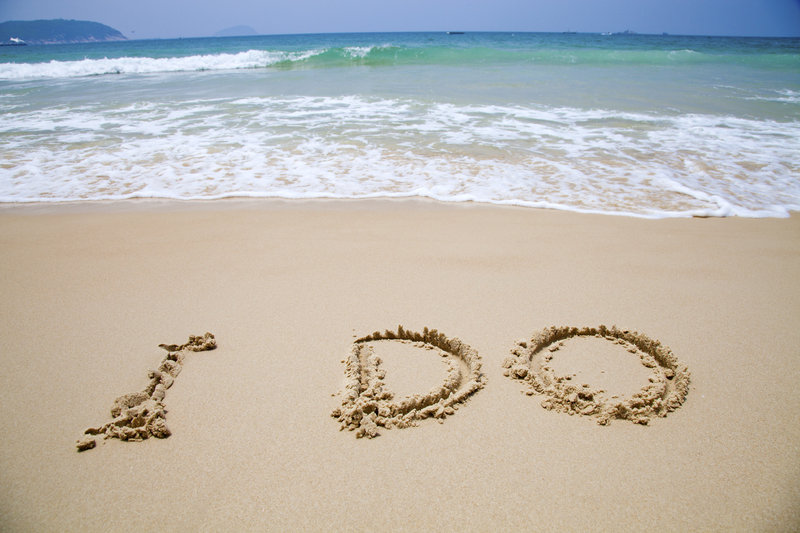 Beach weddings by definition are less formal. So no rehearsal is needed. We are able to discuss any procession questions right there on the beach before the ceremony begins. Trust me, it will be easy and beautiful! I am an ordained, Non-Denominational Minister so I can perform religious wedding ceremonies. I was ordained by Wanderlust Bay Ministries. If you are not looking for a religious ceremony, I perform a beautiful civil ceremony. I love wedding ceremonies that are personalized and incorporate wording meaningful to you. So whether you decide to add your own wedding vows, a reading/poem or a unity ceremony I’m happy to make your wedding unique and personal. 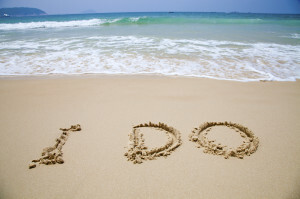 For vow renewals, I love to learn about the original wedding, your family and marriage. I love to include references and mentions from the wedding and anecdotes from your marriage in the ceremony wording. You pick the beach on St. Thomas and I’ll perform the ceremony. 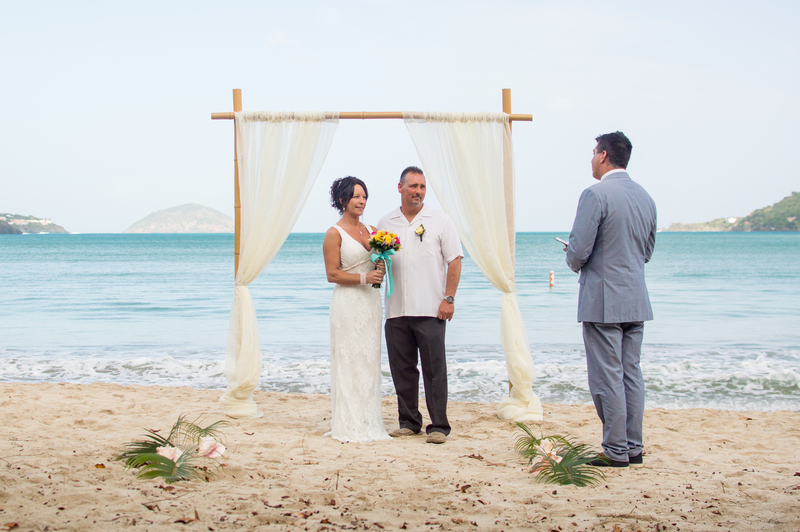 All the beaches on St. Thomas are public and open for your ceremony any time of day. Two of the beaches on St. Thomas are operated by the park system, and they charge a $150 site fee. The site fee is separate from the wedding packages. You’ll need to bring cash the day of to pay when we enter the park. There is also an entry fee for guests of $5/person. Those beaches are Magens Bay and Lindquist Beach (aka Smith Bay Park). Both beaches are gorgeous and definitely worth the site fee in my opinion. Limetree is a “semi-private” beach. There is a small resort sitting on the beach but they limit the type/number of events on the beach. They charge a $100 site fee. But there are also beautiful free beaches as well. My favorite free beaches for weddings are Sapphire and Brewers. If you decide to stay at the beach or other wedding venue after the ceremony, you have to arrange for alternative transportation (all of the wedding locations will have plenty of taxis available). If you have additional guests that need a ride to the wedding, they will need to arrange transportation to and from the ceremony. This is easy enough. So whether you’re guests are on a cruise ship or staying at a resort there are plentiful taxis. Taxi rates charge by the person each way. Most taxi rides run in the $8 – $12 each way. You must apply for the marriage license before coming to St. Thomas. The process is super easy and I’ll be happy to help along the way. A step-by-step guide for the marriage license application process is here. For the vast majority of my couples, I file the marriage license with the court and obtain 2 copies for you. I mail the certified copies to you within about 30 days. But if you need the license immediately or quickly because of health insurance, work related considerations, or you just want it in your hand immediately, you can file the license yourself and receive it the same day. Or, you can pay $50 for your certified copies to be expedited and sent to you within 7 days of the wedding. Have your bride walk down a lovely aisle made of giant conch shells and Areca Palm fronds. A simple, elegant and stunning addition to set the stage for your wedding. The florist cuts fresh fronds the morning of your wedding and will arrange them into a lovely aisle. Obviously this works best for a beach wedding. One of our local florists designs amazing floral bouquets and boutonnieres for my couples. Just let me know the colors and flowers you like and my florist will “wow” you with her artistic talents. The included bouquet is a “standard” size bouquet, but you can upgrade to a larger or cascading bouquet. Most floral options are included, but if you require a ‘rare’ or out of season flower, there may be a small additional cost. If your package includes a bamboo arch, a great idea is to add some floral accents for the arch, which I can also get prices for. A simple, yet lovely, way to celebrate is to share a little champagne! The pop of the cork and the refreshing bubbly is a tradition at weddings everywhere. When available, we prefer Cavicchioli Prosecco. I’ll bring the ice, champagne bucket, champagne flutes and a bottle of champagne for up to 6 guests. If you would prefer you can instead choose either sparkling cider or grape juice. A bottle and up to 6 flutes are included. Professional photography on St. Thomas typically starts at $500 per hour or more. With my package you get professional photos from The Mango Works. On the day of your ceremony, the photography begins about 5 minutes before your beach wedding when you arrive at the beach. With 30 minutes of photography you’ll receive 40-50 photos. 80-100 for an hour. The wedding photos are edited and then uploaded to a private online album. It can take up to 30 days for your wedding photos to be ready. You will have complete ownership of the images for downloading, printing and sharing! If you want to really capture the day and some of the more spontaneous and candid moments, add another hour of photos. I also recommend an extra hour if you have a group of more than 10 guests. This will allow enough time to get photos of your guests in addition to couples portraits. Additional hours are charged at $325 per hour. Most of my couples hire me because they want a stress-free and joyous ceremony. 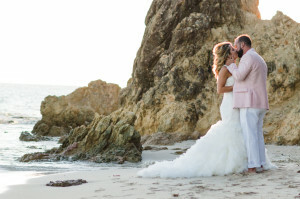 And, of course, you don’t plan a destination wedding without dreaming of a gorgeous setting on a beach. 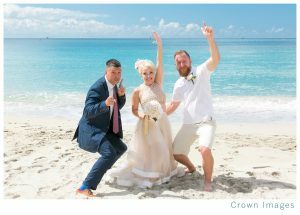 And trust me, the sand, palm trees and blue waters of St. Thomas beaches are as beautiful of a wedding venue as you can imagine. I’m not a huge fan of outlandish weddings with lots of bells and whistles on the beach. It sort of takes away from the natural beauty of it all. But, I think the prettiest weddings I’ve performed, have included an elegant bamboo arch. A bamboo arch blends seamlessly with the natural surroundings and provides a timeless accent for your wedding ceremony. The arch is decorated with white or ivory fabric. The arch can also be decorated with floral accents if you like – I can get you pricing from the florist. 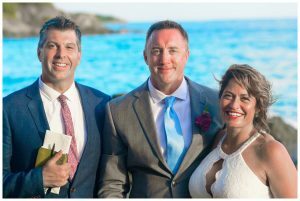 My St. Thomas Wedding Packages are meant to contain just about everything you need for a perfect wedding day. But there are a few items you might want to add on without over complicating your day. Cake! Cake is not included in the packages, but they probably should be! A 6″ cake serves up to 8 people. If you have a larger group you can upgrade the cake to a larger size or 2-tier cake. The cake will be delivered fresh and chilled right to us on the beach and I bring everything you need for enjoying your cake on the beach – cake stand, table, table cloth, serving utensils, plates, forks, etc. And with rum ever present in the islands, it would make sense for the locals to come up with fun new ways to include rum in their diet. So how about a rum punch or pina colada cake! I mean why would you not want rum in your wedding cake? Want my opinion of the most amazing cake ever? Ok, maybe you’re a traditionalist. So go with something like chocolate or vanilla. Just make sure to bring the milk so I can have some! 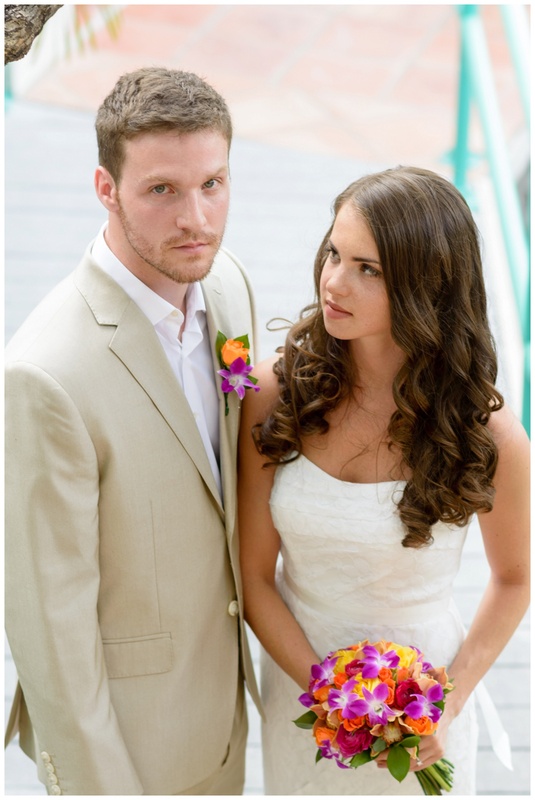 Wedding videography captures, in high-definition, the feel and beauty of your special day. Dow Studios will capture all the memories and special moments of your wedding day. If you are eloping and have family/friends back home that weren’t invited or couldn’t make it, this is a great way to share the day with everyone. Put your minister in the proper frame of mind by having rum punch on the beach. And it’s great for your guests to enjoy as well. An additional hour is $75. Set the mood for your wedding with music. Live musicians are available at hourly rates. I have gone through dozens of “beach speakers” claiming durability and the ability to deliver great sound. I have settled on one speaker that has been outstanding. I’ll bring it fully charged and ready to play your song list or my own song list. It is bluetooth enabled so it can pair with your phone, tablet, etc. If you want to arrive to your beach wedding in style, or if you have a larger group, you might want to go with a limo. There are also private taxi services if you want to provide your guests with transportation to and from the wedding. Hair and Makeup Services are available in your hotel room or villa. I work with several amazing stylists. Traditional hair styling and makeup is available on a cost per service basis. So you can have airbrush, eyelash application, tattoo cover up and other stuff too…I’m just not to familiar with the ins and outs of beauty services. If you want a stylist to your hotel or villa, schedule the appointment for at least 2 hours prior to your pickup time. I recommend Sugar & Spice Artistry – 340-776-5893. Whether by power boat, kayak, sail boat, or helicopter, if you’re interested in an Adventure Wedding, just let me know! 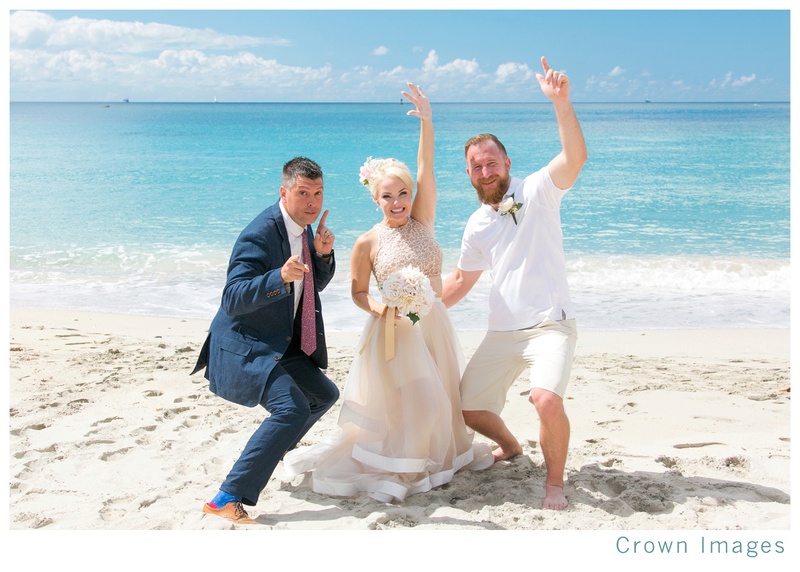 Pick from my St. Thomas Wedding Packages and get down here! To get started planning the perfect wedding in St. Thomas, please call 340-201-6069 or contact me today!